Kniphofia Flamenco, (Kniphofia uvaria), is commonly known by its more descriptive monikers, "red hot poker" or "torch lily," for good reason. With its tall bottle-brush-shaped blooms in bright red and yellow contrasting above dark green foliage, kniphofia definitely lights up the landscape. The blooms of the kniphofia plant make striking cut flower bouquets, but if left in the flower bed, the bright colors will attract hummingbirds to your garden. Plant Kniphofia Flamenco in full sunlight, as the plant won't tolerate shade. Kniphofia Flamenco will do best in areas protected from strong wind. Be sure the soil drains well. Kniphofia Flamenco can grow in nearly any soil type, but can rot in soggy soil. Allow the top of the soil to dry out between waterings. Water until the soil is most, but not soggy. Too much water can rot the roots of Kniphofia Flamenco. Fertilize Kniphofia Flamenco in early spring, using an all-purpose water-soluble fertilizer. Don't fertilize after spring, because too much fertilizer will cause excessive foliage growth at the expense of flowers, and will make the plant more susceptible to freezing weather. Remove spent blooms to encourage Kniphofia Flamenco to continue blooming later into the summer. 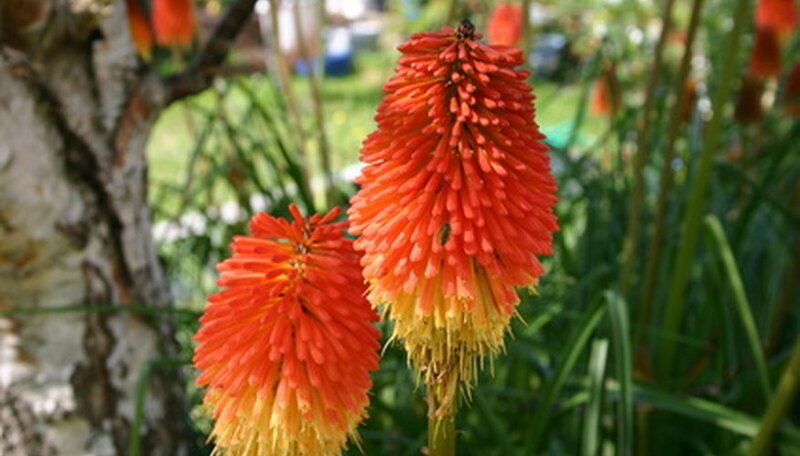 Cut Kniphofia Flamenco down to the base of the plant in autumn if you live in a cold winter climate. Otherwise, tie the foliage of Kniphofia Flamenco together to keep excessive moisture from the center of the plant.